Nadia Nibbs teaches multicultural literature at Hiawatha Collegiate High School. Photo by Annabelle Marcovici. If you knocked on Nadia Nibbs’ classroom door in Hiawatha Collegiate High School on a recent Tuesday morning, Joseline Ruiz would have answered, shaken your hand and given you a quick summary of what she and her classmates were studying that day. “We’re learning about personal identity and social identity and about how people see us,” she explained. A few students made a small step into the circle. They returned to their places for the next question. Almost no one stepped into the circle. A good crowd of students stepped inside. Ruiz already knows how social identity can affect people in the real world. Tragic things, she said, can happen to people because they express themselves in a certain way. “That’s something that shouldn’t be happening,” she said. That’s why they’re all learning to communicate, in no uncertain terms, about a subject that many adults still struggle with in their day-to-day lives: social justice. 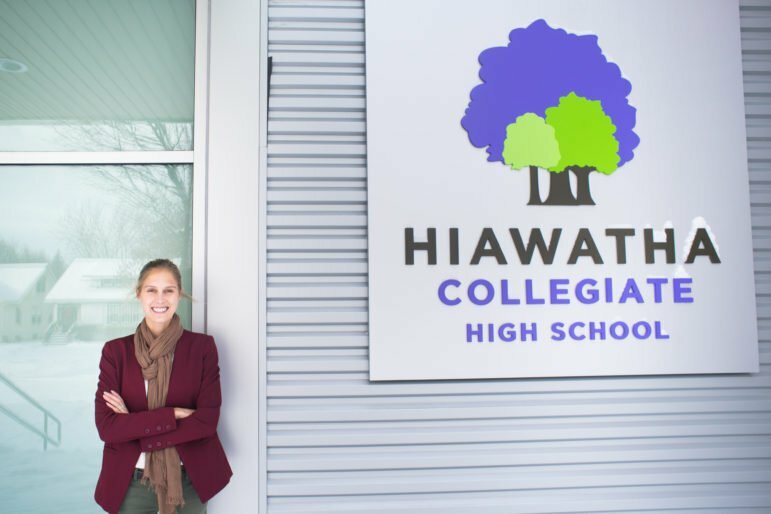 Identity, social justice and equity are deeply embedded into an already rigorous curriculum at Hiawatha Collegiate High School. Down the hall, in human geography class, students were getting a definition of the word “misogyny.” On the second floor, students were working on their reading skills with the literary works of the Harlem Renaissance. All the while, the students are having conversations about race, identity and class that most scholars don’t encounter until years later. Getting this knowledge at a younger age, she said, gives the students an edge. She still has plenty of time to decide. She’s part of Hiawatha Collegiate High School’s second class ever. This year’s sophomores – the first ones in the school’s history – are actually also the founding class of the Hiawatha Network. Their school system grew up around them. That is, until they reached seventh grade. Local parents, who had been promised a college-ready education for their kids, were worried about what would happen after they graduated from middle school and had to join one of the large public schools in Minneapolis. That’s definitely how Cynthia Bobo felt. A high school plan had already been in the works, but in response to parents’ concerns, Hiawatha accelerated it and opened the school four years ahead of schedule. Bobo was one of the parents who spent as much time as she could in groups and committees, doing whatever she could to help make that happen. To her pleasure, she said, they didn’t have to fight to be heard. “We voiced our opinions of what we wanted to see in the schools, and they did it,” she said. The students started out in a basement of a nearby school. By January of last year, their brand new campus was ready. Bobo loves the education her daughter is getting. High school, she said, has been a tremendous period of growth for her daughter. She’s in four extracurriculars, including a club for Black students and the principal’s cabinet. When she graduates, Bobo said, her daughter will be the first person in her family to go to college. According to the Minnesota Department of Education’s 2016 data, 99 percent of Hiawatha Collegiate High School students are people of color. The majority of those students are Latino. Forty-six percent are counted as English language learners. The vast majority qualify for free or reduced-price lunches. Meals at Hiawatha Collegiate High School are free for all students. These are the data points that often get cited – whether with intent to praise or to criticize – when people discuss schools like Hiawatha Collegiate High School and questions of educational equity. Hiawatha Network’s senior director of community engagement Ambar Hanson believes that real equity is more complicated than that. The challenge, she said, is addressing the various sources of oppression in students’ lives – white supremacy, poverty and patriarchy – while still acknowledging and nurturing the strength and capability these students and their communities possess. This is something that Hiawatha Academies has done with some success. The charter school network’s list of awards and accolades for student performance and closing the achievement gap stretch back for years. Its schools frequently appear at the top of the Star Tribune’s “Beating the Odds” list. That’s because the lofty expectations come with sturdy supports. 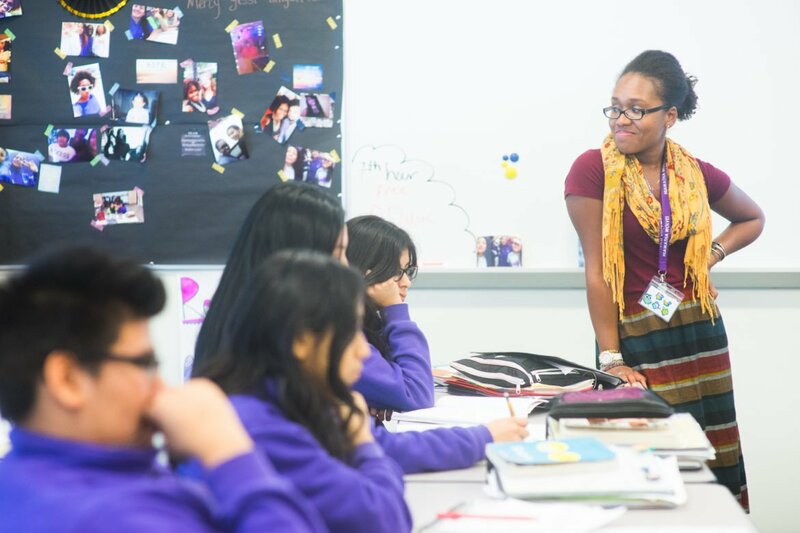 Twenty percent of teachers and staff are people of color, as opposed to Minnesota’s state average: about 4 percent. Those teachers go through regular retreats and staff-led professional development sessions, each of them on a different aspect of race and equity. According to Director of Operations Anna Lee Eddie, finding the right candidates is less about having a perfect knowledge of equity and social justice and more about having a desire to improve and an open mind. Director of Operations Anna Lee Eddie. Photo by Annabelle Marcovici. “When we do our initial screening, we ask a few questions around the staffer’s current equity understanding and their willingness to grow in that area,” she said. She joined the Hiawatha network four years ago because she wanted to make a difference in Minneapolis’ educational landscape. She and the rest of the leadership team is comprised mostly of women. Students are also supported when it comes to their mental health. Classrooms are trauma-informed, with the emotional needs of students in mind. Beatriz Alcazar, resident social worker, does everything from forming support groups to making sure students have access to necessities as simple as clothes. For students who are starting off their high school career by learning English, there are regular lessons in Spanish, so they don’t have to do remedial work until they’re fluent. Hiawatha Collegiate High School also reserves time at the end of each day for students to finish their incomplete homework assignments and get them turned in the next day. Students have their own small advisory groups – about 15 students each – which they keep for all four of their years at the high school. “It’s just better,” she said. There’s Hiawatha Collegiate High School’s approach to discipline: a set of guidelines. A certain number of infractions means that students have to report to a discipline night school class, which is essentially a meditation course. Peer mediation, meditation and yoga all play a role in teaching students the art of self-discipline, awareness and care. Of course, Hiawatha Collegiate High School is not perfect, as staff and leadership will tell you. Both the student body and the staff could be more diverse. There are times when the disciplinary methods might be more punitive than instructive, or there are just moments of poor execution. That’s why another tenet of the high school’s structure is willingness to change, and to listen to teachers and students. The mindset is also with students, who are encouraged to challenge the authority in their lives, to think critically and to push themselves. After all, he said, when he’s in college, he’s going to need to know how to do that. He hasn’t decided what he wants to be when he gets older, but he’s thinking about getting into politics. After witnessing the way things have been going in the political sphere lately, there are a few things he’d like to change. Watching the 2016 election happen, he said, just made the lenses Hiawatha had given him sharper. “Sometimes we go on in our life and don’t see what’s really going on around us – how there are differences in class and gender and how other people see the world,” he said. College may be Hiawatha’s mission, but the ultimate goal is to put these students – and students who look like them – in positions of power. If they can get past the structures that seek to oppress them – with all the critical thinking skills, knowledge and connections they’ll make along the way – they’ll be that much closer to dismantling them and making the world a better place. “We’re trying to disrupt the system here in Minneapolis,” Eddie said. These kids and these teachers aren’t talking about “beating the odds.” They’re talking about changing the game. What a fantastic article! I’m personally excited that there is this educational opportunity in Minneapolis. The values instilled in the students are the building blocks to achieve powerful positive results both individually and as part of a member of the community. Cheers to the students and the awesome faculty at this educational center of excellence! Thank you for all you’re doing to raise leaders who can and will make a positive impact in the world we all live in and share!! !